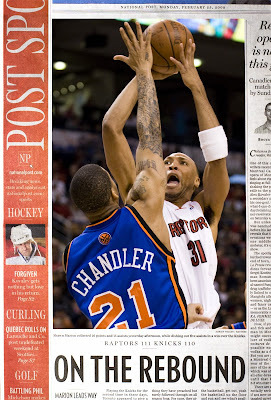 Here's a bit of what happened for me this past week; a couple sports fronts. Sports photography was what I was first interested in. Now I realise that shooting sports, even though it requires skills and knowledge, is quite repetitive. One team wins, one loses. The situation are predictable, to some extent, and you just have to be in the spot where you have the most chance of getting the picture. Shooting sports can be both really frustrating and really rewarding. It requires almost no creativity, unlike the rest of the jobs a photojournalist will be assigned to. Here's one of my favourite photos. 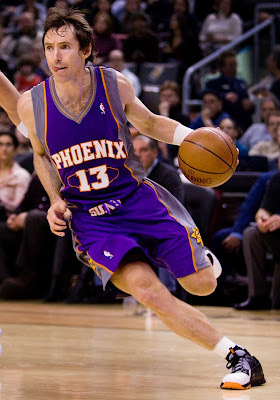 Not that it's a great action shot (it's actually more of a trading card photo), but it's a nice and clean photo of Steve Nash and he's my favourite player. I use to come to Toronto every year when he was in town. I remember sitting in the stand, with the camera I snuck in, trying to get a picture of my hero. I remember saying that, one day, I would be on the baseline with the big camera (along with the guys I was jealous of). It became a goal, something I had actually written on my To-Do List: "Photograph Steve Nash before he retires". And now, that picture is framed nice and big in my living room. Also on the To-Do List, visit New Zealand. And that's happening in 9 days!